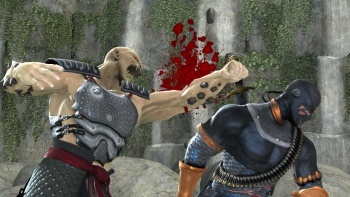 Midway to Sell Off Mortal Kombat? Beleaguered publisher Midway might be ready to sell off the rights to its iconic Mortal Kombat franchise in order to try and stay afloat. A.) Screw over former employees to give managers and executives a hefty cash bonus? B.) Try frantically to find someone to buy off your most storied and well-known franchise? The answer, as you might have guessed, is C. Recently-leaked court documents surrounding Midway's fight to keep its head above water have shed some light on the publisher's desperate plans. The company has set aside almost $4 million USD, to be divided amongst executives and managers if the company succeeds in meeting target goals. Where is a recently-bankrupt company finding that much money? Why, by reneging on a promise to pay ex-employees the remainder of the PTO (that's Paid Time Off, for those who don't know the lingo) they'd saved up before being laid off, it seems. One of these goals was met back in February, when Ubisoft acquired the Wheelman franchise, putting a badly-needed half-million into the company's coffers. Another goal - arguably the most important - is to find someone willing to buy Mortal Kombat. Now, as anyone who grew up in the 1990s can tell you, Mortal Kombat is quite the (in)famous franchise. It might not be quite as big a name these days as it once was, but it still sells - Mortal Kombat vs. DC Universe moved almost 2 million copies. Selling off MK just might give Midway the funds it needs to stay afloat and get back in gear. On the other hand, if Midway does sell off Mortal Kombat, what the hell will it have left?